Before we get into it, we should probably pump the brakes and note that American pop culture isn’t broken. Television is in the midst of a creative renaissance. It’s a golden age of comic book movies and science fiction cinema. A slew of recent YA fiction and adult fiction books that have kickstarted a renewed sense of interest in reading. The Internet is giving us easier access to global entertainment that in turn influences us, usually for the better. What this is about isn’t actually our pop culture but in how we’ve started digesting it, and therefore demanding it. As these pop culture creators and consumers keep trying to unlock the keys to their happiness, it sometimes feels like we’re taking some very specific learnings and starting to apply them to everything. That, in turn, is starting to affect the way TV and movies and other pop culture ephemera are being conceived. Pop culture creators are playing into a kind-of nostalgia loop, but it’s our fault as the audience as well. We’ve come to expect and want nostalgia over new forms of pop culture (for the most part). And it’s a hard cycle to break. There’s a lot of money being made right now and it’s hard to change anything while it makes sense financially. However, there are some ways to help evolve the loop. As a child of the 80’s, there’s a sense of pride in the fact that the 80’s generation is clearly in charge right now. Everything that we grew up enjoying as kids has just about been recycled into a new movie, TV show or become part of the daily Internet lexicon that lets us all wink and nod to one another in acknowledgement. Transformers, Saved By The Bell, Full House, Star Wars, etc. It makes sense. I imagine this is how it usually happens. When the next generation takes control, I’m sure we’ll start seeing some kind of pop culture resurgence of TV shows, movies and comics specific to their childhoods as well. Star Trek isn’t specific to this generation but the Star Trek movies kinda are. Star Trek II: Wrath of Khan came out in 1982 and was in constant rotation on TVs throughout the decade. Without trying, It was the kind of movie a kid would watch two, three times a year without thinking anything of it. 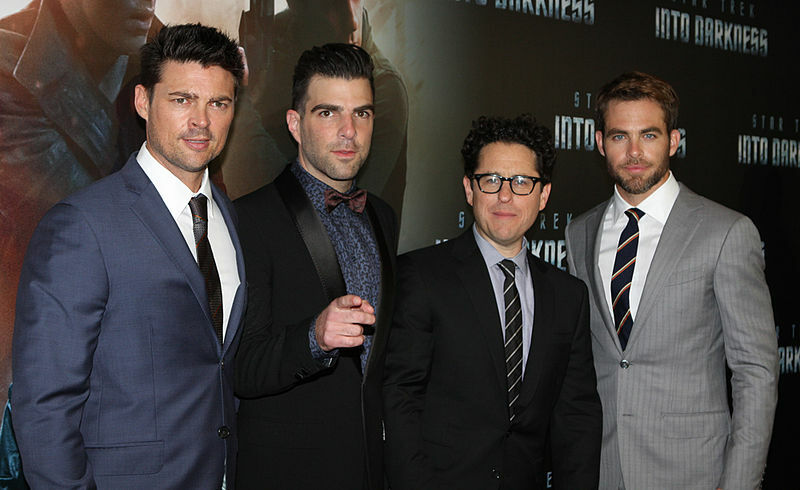 That brings us to Star Trek Into Darkness, the 2013 release that is the second film in the Star Trek film reboot series. 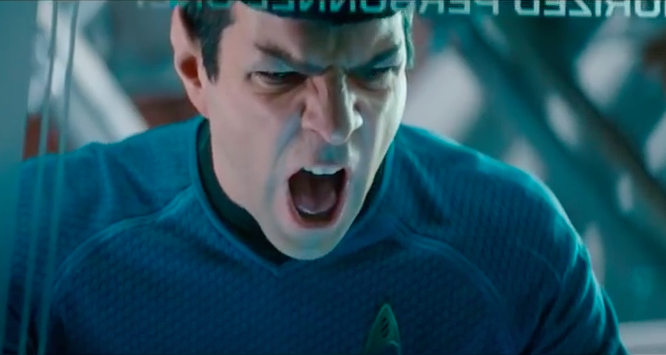 The film isn’t a remake of Wrath of Khan but instead a hybrid prequel/retelling of what happens when the Enterprise crew meet Khan Noonian Singh, a (now much whiter for some reason) genetically-engineered villain who wants to…take over the world? It’s a little muddled this time around, to be honest. Whereas Wrath of Khan will probably continue on as a piece of notable pop culture history, STID will likely exist as a kind of pop culture Mash Note that isn’t all that vital (except for the fact that STID is the rare Hollywood blockbuster that is also a 9/11 Truther allegory). Into Darkness exists solely to say “Hey, remember this?! ?” In the end, that’s all it has to say. It doesn’t do much with it’s highly-anticipated villain. It briefly reintroduces Klingons just for the sake of showing you Klingons. They deus ex machina the hell out of the emotional ending of the story, making the entire impact moot. It was more important to show you the reference so you could nod in acknowledgement than it was to try and tell a compelling story. Successful as they are, the Marvel movies are overflowing with references and nods and codes. That’s all well and good for now, but the more that universe grows, the less people will have all of the information. And the more you inundate them with references to things they don’t care about, the less they’ll care about the story you’re telling now. This isn’t to say that you shouldn’t include easter eggs and stingers in your pop culture. My point is to say that the story you are telling right here and now is the most important thing. Focus on that. Focus on making this the kind of film or show that people still want to watch 30 years from now rather than trying to remind people about something that happened 30 years ago. Remember LOST? How could you forget. You got so mad about it. If you were someone who spent an inordinate amount of time on the Internet trying to figure the show out in its early seasons, you probably eventually visited the site LOST Answers. The point of the site was that, despite everyone’s complaining, every question on LOST actually had a logical answer. Some of the questions were answered with actual plot points. There were polar bears on the island because Dharma Initiative brought them there. The sideways universe was in fact a kind-of purgatory. So on and so forth. But what about all of the other questions? What IS the island? How could Locke walk? What was the deal with Walt? How can there be time travel? LOST Answers summed up the answers to all of these questions in one fell swoop. And honestly, that’s all there is to it (The site’s author, Cody Johnston, does a fabulous breakdown of all these questions and their simple answers over here). Ultimately, the point of LOST wasn’t who built the statues or what the hatch numbers meant or how everyone seemed to know one another before they got to the island. 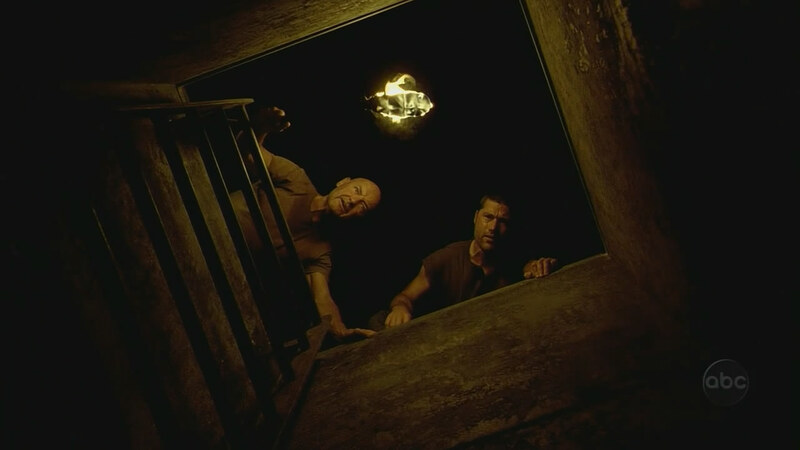 The point of LOST was the characters and whether or not they learned what they needed to learn from their time together. Now, ABC and the show creators shot themselves in the foot when they played up the mysteries from the get-go and milked them for everything they were worth, all the while making us think that there was some unifying theory that it was all leading towards. That’s a story for another day. The point right now, however, is that while we were all so fixated on the island and the mysteries, we were basically chasing the MacGuffin. If you’re unfamiliar, that’s the plot device in the story that acts as the goal or motivation but is ultimately not the point. If you’ve ever watched a movie where the characters are all racing to find something (a box, a statue, a treasure), that’s the MacGuffin. In the end, you’re not supposed to care about the MacGuffin. It’s just the excuse for us to get to know these characters and be invested in their growth or change. We can argue over the quality of LOST all day but the truth is that they delivered on that goal. Every character changed from the time the show started to the time the show ended. They evolved (or devolved) and we witnessed their journey. As for who the heck that was shooting at the Losties in that outrigger, not only will we never know but it doesn’t really matter. Sometimes it feels like audiences are still using this kind of viewing experience to dictate the way they watch other shows today. Many people reacted to the season one finale of True Detective with disappointment about the way the Yellow King mystery ultimately fell to the wayside. Because of the setup, many viewers seemed to want that to be the critical learning at the end of the story. But that’s not what True Detective was about. It’s a character study. It’s the story of two cops who represent very different ideals and very different ideas of masculinity who are thrown together in a blender and forced to try and work together, ultimately forging a strong friendship. 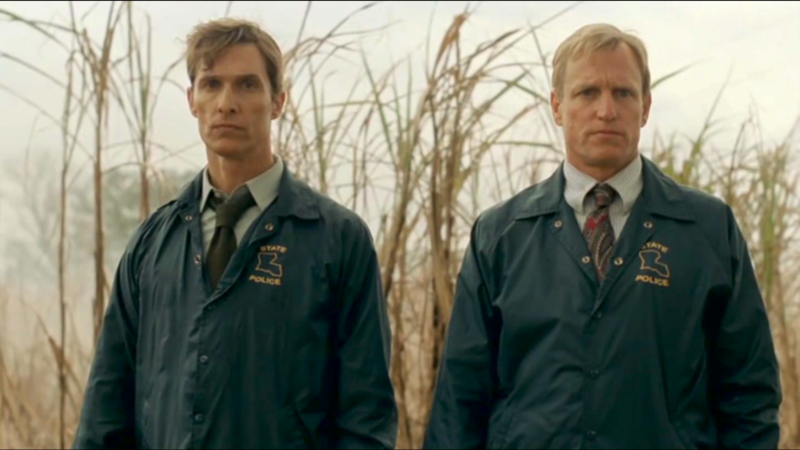 If your problem with True Detective was that they didn’t follow through on the Yellow King, you watched it incorrectly. You focused on the MacGuffin. You focused on the hook, but not the point. Pop culture creations that focus on the MacGuffin are doomed, too. Marvel would be wise to remember that as they build multiple projects around the Infinity Stones. Star Trek films need to be more than just references to memorable incidents from previous versions, which themselves become MacGuffins in these new stories. Audiences will buy into the hook, but once they realize the hook is all you’re giving them, they’ll stay away the next time around. There’s that joke in The Simpsons episode Missionary: Impossible where Homer donates money to PBS in order to keep watching ‘Do Shut Up,’ which is billed as England’s longest-running TV series, with a total of seven episodes. Compared to U.S. TV shows, the usual British TV series is much shorter and the much less defined. It’s not uncommon for an entire “season” of a TV show there to be comprised of three episodes. Fawlty Towers is well-remembered as one of the best British TV series of all-time and rightfully so. Despite the fact that it probably could have milked it’s formula for years and years, the iconic program ran for just 12 episodes. It was a conscious decision not to keep going and a decision that made an impression on future showmakers. Ricky Gervais and Steven Merchant notably ended the run of The Office after two series and a special, doing the same for Extras later on. They all could have kept going but decided it was better for the integrity of the product to walk away while they were ahead, cementing the show legacies in the process. 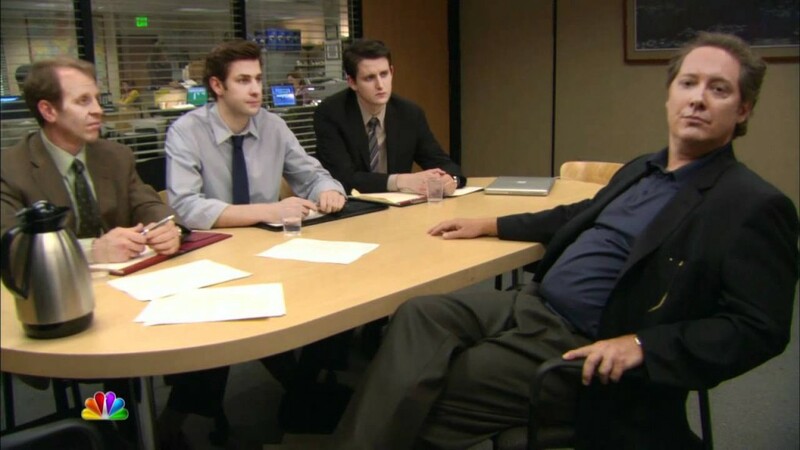 Compare that to America’s The Office, which ran for nine seasons. Most would agree that it ran for at least two seasons too long and, while it’s fondly remembered, the dropoff in quality affected the overall way the show was perceived. This isn’t an isolated comparison. We can all think of TV shows that outstayed their welcome and kept going long after the well had run dry (Hi, Dexter). The American model of television seasons almost always dooms a show to mediocrity. How much stronger and tighter could LOST have been had they been forced to tell their story with ten episode seasons? The writers are on record as saying they were forced to add filler along the way because they didn’t know how long the show would last. Had they been able to see a concise number of episodes ahead, they could have trimmed the fat and told the story exactly how they wanted. The Netflix series Sense8 is a perfect embodiment of this. The Wachowskis are to be appreciated but sometimes you really wish there was a third Wachowski who was really good at editing. Because good God do they need it. Not just in terms of ideas but also in plot. Sense8’s first season is 12 episodes long. If you can make it all the way through, more power to you. While there are some interesting ideas and visuals at play, there is also a LOT of filler and extraneous plot that really doesn’t do anything to move the story forward. While you can appreciate their choices on an artistic level, you’ll probably stopped watching the show on an actual level out of boredom. If you trimmed those 12 episodes down to eight, you could tell the exact same story but at a much more enjoyable and valuable rate. More bang for the buck. It means stronger episodes, which in turn make the overall series stronger. You know that old saying about firewood? When you’re camping and need firewood, collect as much as you think you need…and then double it. A lot of American TV shows, especially genre shows, would benefit from doing the opposite. Figure out how many episodes you think you need to tell the story and then trim that by two. What you think takes ten episodes might end up a much stronger product if you only give yourself eight. Don’t say it doesn’t work, it’s been working in Europe for years. There’s a reason we take so many shows from England, Sweden, and elsewhere and repackage them. The problem is, we usually take a show that had a ten-episode season and turn it into a show with a 13-episode season, diluting the product along the way. It’s understandable. It’s hard to let go of something you’ve grown attached to and didn’t feel like got a chance to see itself through. But did that Veronica Mars movie end up feeling necessary? We all liked The Terminator and T2 but it’s become clear that we’ve gone back one too many times now. Perhaps two too many. Dumb & Dumber To certainly didn’t scratch the comedy itch some thought it would. The new Arrested Development season was…fine. Community on Yahoo! was…something that exists. Zoolander 2 is here…if you’re into that. Recent news of a Friday Night Lights cast reunion has sparked a new round of calls for a return to Dillon, TX in the form of a Netflix series or a movie. But…a movie about WHAT? In what possible way could you take all of those characters and wrangle them back together years later in a plot that not only makes sense but also feels necessary? You can’t. There’s no way. There was an essence to FNL and what it was about in those five seasons that you cannot get back by continuing the story any further. You could make a movie about the Taylors in Philadelphia, in theory. You could make a movie about Vince as tries to navigate his college football career. You could make a movie about Them Riggins Boys for some reason. But whatever you did, you could never recapture what made Friday Night Lights great. It’s gone. And you have to let it go. You got five seasons worth of great storytelling and acting. Be thankful for that and move on. In this age of petitions and crowdfunding and social media, it’s easy to validate your pop culture desires than ever before. If you want another season of your favorite TV show bad enough, there are ways to try and make that happen. But it doesn’t mean you should. Of course there are financial considerations at play here. If something makes money, the suits are going to want more of that thing. But from the perspective of pop culture creators and fans, you can make a conscious choice as well. Know when to walk away. Know when a story has some to its logical conclusion and be okay with that. Don’t try to force a continuation after the critical piece or pieces are gone (Hi, The Office).